The Christmas season is a time of year for family and fun. Unfortunately, it’s also a time for overindulgences that can lead to weight gain. For many, those extra Christmas kilos can represent the greatest contribution to their annual weight gain. Holiday season after holiday season, a modest one to two kilo weight gain can easily go unnoticed and add up over the years. 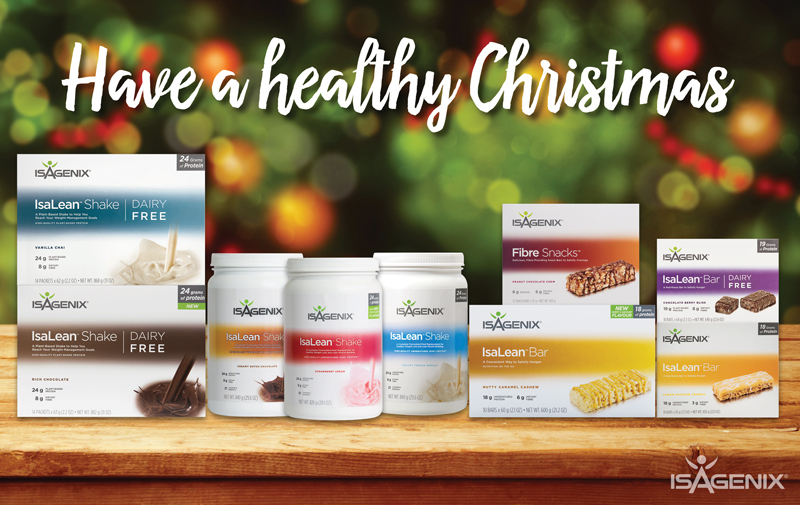 You can still celebrate Christmas without the weight gain! Instead of waiting for the new year to lose the extra weight you accumulated during the holiday season, plan to avoid gaining it in the first place. These tips can help you to have an enjoyable holiday season without getting weighed down. Indulging in a few treats here and there does not mean you’ve ruined your progress. You can still savour indulgent choices within the context of a healthy lifestyle. Remove the influence of a rumbling stomach by grabbing a light meal or snack before you go to a party. Drinking an IsaLean™ Shake on the way to a cocktail party or grabbing a nutrient-dense snack before a dinner party can help you keep your cravings at bay. By managing hunger in advance, you can feel confident that appetite won’t overwhelm your better judgment. Committing to a Cleanse Day schedule throughout the festive season can help you manage the extra calories that this time of year often brings. Working in a Cleanse Day or two around occasions when you know you are going to overindulge can help you stay on track. When the holiday season comes around, so do an array of seasonal treats. Allowing yourself to indulge on occasion is a must but finding healthier options that still fulfill your cravings for holidays favourites can be just as important. Don’t spend the new year ‘recovering’ from Christmas weight gain. Take a proactive approach this holiday season so annual weight gain can be more easily avoided.